What is risk based decision making? Alex Sidorenko from RISK-ACADEMY talks about his views on risk-based decision making, why it’s harder than we think and not natural for people in the workplace. Alex also talks about the role of the risk manager to help embed risk based decision making. DOWNLOAD THE FREE RISK MANAGEMENT BOOK: https://www.risk-academy.ru/en/download/risk-management-book/ Watch more free… Continue reading What is risk based decision making? What is the best resource for risk management to learn about cognitive biases, risk perception, and the reasons why simple risk assesments and risk workshops have almost zero chances to work? That’s right, old CIA handbook: https://www.cia.gov/library/center-for-the-study-of-intelligence/csi-publications/books-and-monographs/psychology-of-intelligence-analysis/PsychofIntelNew.pdf Enjoy! Should it be risk culture or integrating risk management principles into the corporate culture? Alex Sidorenko from RISK-ACADEMY talks about risk culture in this short video. What if instead of calling it risk culture, we should instead think of it as integrating risk management principle into the overall corporate culture of the organisation. 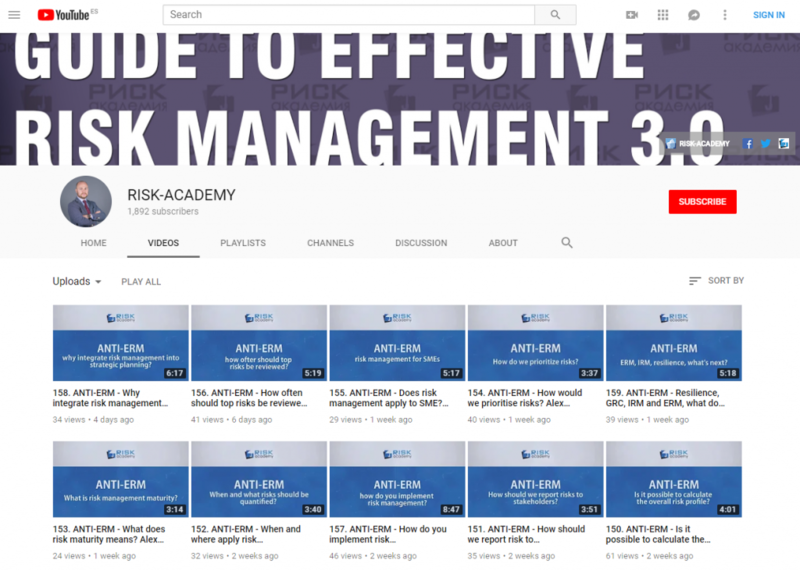 DOWNLOAD THE FREE RISK MANAGEMENT BOOK: https://www.risk-academy.ru/en/download/risk-management-book/ Watch more free risk management videos on http://www.risk-academy.ru/en/risk-management-video/ or… Continue reading Should it be risk culture or integrating risk management principles into the corporate culture? Is commitment from the top even real? In this short video Alex Sidorenko from RISK-ACADEMY talks about commitment from the top. What if there is an alternative way to look at senior management support of risk management. It may change how you implement risk management in your organisation. DOWNLOAD THE FREE RISK MANAGEMENT BOOK: https://www.risk-academy.ru/en/download/risk-management-book/ Watch more free risk management… Continue reading Is commitment from the top even real?